basically bertram & vivian: Trains! A quick update to say I’ve re-entered the world of the living, but I am still very much recovering. And, now back to our regularly scheduled post-a-day challenge post. I think every boy goes through the train phase. I feel like just yesterday, young Master B had one contained train set, nothing fancy—three wooden trains and a figure-8 track. Then, over the holidays, he acquired another a Thomas the Tank Engine set and then another set with loads of track and suddenly I feel like we have to install the train set and de-install the train set in the living room EVERY DAY. We live in an urban apartment, so room is at a premium. We can’t just leave the train set up for young Miss Vivian to trip over while she attempts to cruise the entire perimeter of the play room. The thing is, Bertram likes the train set, but Parental Unit #2 loves the train set. By far, I believe that Parental Unit #2 goes out of his way to make crazy configurations that sprawl across our main living space. I guess you can take the boy away from the trains, but not the trains away from the boy. No figure 8 even, that's a complex shape that needs extra curves and a bridge or crossing piece. Just an oval. 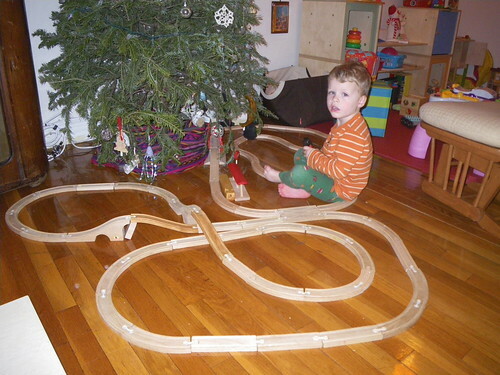 But now our tracks and options have exploded, actually this photo on Xmas is just two of the tree tracks we now have. I think I suggest getting out the trains 3 out of 4 times, but Bertram does love them. The most fun for me is to let him go wherever he want's with the track, and then when he's done I try and figure out how to connect it all back into loops with no changes (or minimum) to his layout. I do also help out by making sure to hand him a bridge when he's gotten to a crossing, or make sure he's got plenty of curves nearby when he's about to run into the wall or toy box. but mostly he's in charge. Oh and I'm wrong I see parts of all three tracks in the photo, but not all the fancy parts used.